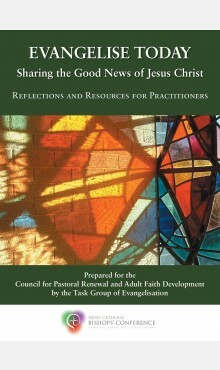 Evangelise Today: Sharing the Good News of Jesus Christ, Reflections and Resources for Practitioners is the new publication from the Council for Pastoral Renewal and Adult Faith Development of the Irsh Catholic Bishops’ Conference. How do we make the pilgrimage of faith today? How can we accompany one another, ever more questioning and questing, on the journey? Is it possible for believers and people who find faith difficult to have real conversations? In the Irish Church, we have Share the Good News: National Directory for Catechesis in Ireland(2010) as ‘a framework indicating principles and guidelines for evangelisation, catechesis and religious education today’ (p. ix). This compilation of reflections and resources for practitioners is designed to support the work of sharing the Good News, of communicating today the message and the person of Jesus, so that together we may find, celebrate and spread the joy of the Gospel.